This is a printed medium-light weight sweater knit, drapey with 50% widthwise and 15% lengthwise stretch. It has a soft and sweatery hand, and the fine knit stitch is tight yet breathable. 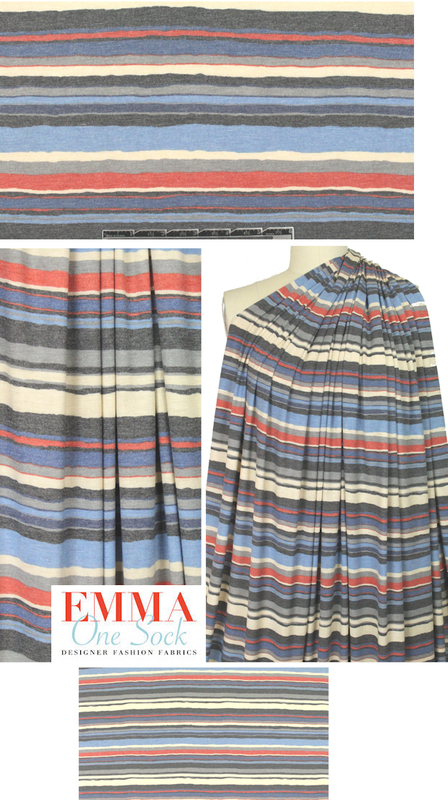 The stripe has an 8.5" repeat and the colors are heathered charcoal, rouge, denim, sand, light blue and light gray (PANTONE 18-1651, 17-4027, 11-0809, 13-1008, etc.). It is perfect for drapey tops, tunics, cardigans, etc. The manufacturer recommends hand wash in cool water, lay flat or hang to dry.